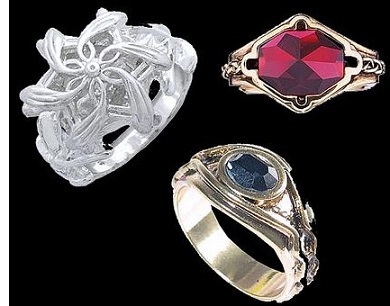 Narya, Nenya & Vilya - While the Ring of Power worn by Sauron is the most famous of the rings, the Three Rings forged for the Elves were also of special quality. They were different from the Rings given to the Dwarves and to Mortal Men in that they were forged apart from those, and Sauron had to first possess them before he could control their bearers. And because Sauron so desired them Celebrimbor was determined to keep them from falling into the Dark Lord's hands. And Galadriel had kept her ring hidden in Lothlórien all the way until the end of the Third Age.